I have a confession: I once went 11 months without a shower. For the past dozen years, I have been a resident of Allen Park, a quirky little private community off 1300 East, across from Westminster College. A couple of generations of teenagers know it better as Hobbitville, because, as the story goes, it's a community of little people. I've never understood how this legend got started, but I can't tell you how many people have looked crestfallen after I told them that no, Virginia, there are no actual hobbits in Hobbitville. Allen Park sits on a strip of about eight acres running west to east almost two city blocks along Emigration Creek. In addition to a main house, there are about 15 individual buildings—including a number of clapboard bungalows, which once contained about 30 apartments. At one time, the bungalows were well-maintained, the grounds were manicured and the property was brightly illuminated with a series of wrought-iron lamps on rock-and-concrete pillars. Today, the paint is peeling, the grass is losing ground to weeds, the lamps are gone and only eight of us live quietly in what was once a bustling community. It's no wonder curious kids turned Allen Park into a de facto spook alley. On weekends during the summer months, their antics became an evening ritual. Around 10 p.m., teens looking for hobbits would swarm on the sidewalk outside the brick pillars leading into the park. Then, as if responding to a signal from the earth's magnetic field, they would surge down the long driveway and past the main house that guards the entrance. It was a game. Ignoring "No Trespassing" signs, the kids would try to see how far they could venture in before they were detected. One evening during my first summer in Allen Park, I witnessed this cycle over a couple of six-packs with Ruth Price, the granddaughter of Allen Park founder Dr. George A. Allen, and Ruth's husband, Glen Becker. We sat in the dark on lawn chairs, not far from the back of the main house, drinking beer and waiting for the show to start. Glen waited until several intruders were almost parallel with our concealed spot. Then he opened up with a blast of his signature salty language through an electronic megaphone. The kids shrieked as if being confronted by the ghost of Dr. Allen himself, turned around and skittered pell-mell toward the front gate. For the most part, these interlopers did little damage. However, my neighbor came out one morning to find his Toyota 4-Runner's rear window shattered. On many nights, I've woken up to the sound of tires squealing and horns blowing. And, late one night, Glen intercepted a group of troublemakers who had hijacked the trailer holding my small sailboat and were gleefully wheeling it down the driveway toward 1300 East. 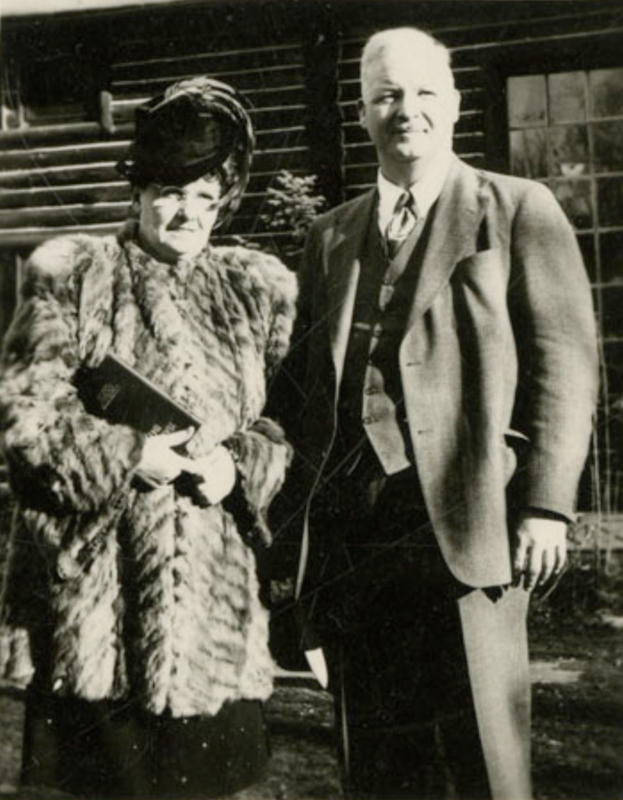 Dr. George A. Allen and his wife, Ruth. Dr. Allen, an Illinois-trained physician with eclectic tastes, acquired this piece of ground in 1931, 11 years after moving to Utah. Dr. Allen had a passion for exotic birds and compassion for those least likely to afford his services. During the Great Depression, that included a lot of people. "He was an up-and-coming young doctor with a big practice among the worker class," his oldest daughter, Mary Rose Black, told me in 2009. "And he would make personal calls a lot ... He never turned anybody down that needed him to come to their house." When her father acquired this land, she said, it was a small farm. The Allens—Dr. George, his wife, Ruth, and three children—moved into the barn near the west end of the property. "We lived there for about a year or so, and my little sister was born there," Mary Rose recalled. "Father was so embarrassed because he was a doctor, but my mother refused to go to the hospital. She said she wanted her last child to be born on this property." In the meantime, Scandinavian craftsmen were building an imposing log home for them nearby. "There was one in particular whose name was Mr. Eskelsen," she said. "Very strange little bachelor guy. And he was an immigrant. But he knew how to build log houses." In the 1930s, the Allens built a series of winding paths along Emigration Creek in the expanse of property east of the log house. They planted trees and shrubs and created nooks with benches and tables where visitors could rest. They built fountains. They added cages and nesting boxes for Dr. Allen's growing collection of rare pheasants and other exotic birds. Every Sunday, the property was opened to the general public. Mary Rose remembers a sign out on 1300 East that said, "Visitors Welcome." The Allens, of course, had help. "There were lots of people that—they were quite honorable [but] they couldn't pay their doctor bills," Mary Rose said. "And some of them would come and say, 'Can't pay you money but I'll work for you.'" With cash in short supply, the family found other creative ways to develop the property. They welcomed truckloads of soil discarded by nearby building projects. They also convinced street construction crews to dump unwanted road material in Allen Park. "And we'd have to run out with our picks and shovels and spread it fast," Amy Allen Price, Mary Rose's younger sister, said in a 1992 interview. "And then father would take the car and run back and forth over it. That's how the road got built." Meanwhile, Dr. Allen was already making a name for himself beyond the boundaries of his nascent community. In 1932, author J. Cecil Alter included him in a collection of biographies of local community leaders, citing his involvement "with nearly every important civic movement in recent years." Among many other things, Alter gave Dr. Allen credit for conceiving the idea for the Salt Lake Zoological Society. He was its president when it broke ground for the Hogle Zoo. "Largely through his untiring efforts, this has developed into one of the most modern and complete zoos in the West," he gushed. To generate interest in the new zoo, Mary Rose said, her father could be quite a showman. "At noontime, he would take an animal from the zoo—I think a young mountain lion or something like that—on a leash, and he would walk up and down Main Street with it. And people would [ask], 'Hello, doctor, where did you get that?'" From time to time, Dr. Allen would also keep zoo animals on the property. Amy said the list included an elephant, a chimpanzee and several reindeer. The family also collected an unusual assortment of "pets" including a coyote, a sandhill crane named Sandy and a raccoon that sometimes followed the girls to school. He also served as president of the Sugar House Businessmen's League, Alter wrote, "and it was largely due to his suggestion and assistance that a monument was erected to commemorate the founding of the sugar industry in Utah." That monument still towers over the plaza on the southwest corner of 2100 South and Highland Drive. Mary Rose recalls going downtown with her mother to the office of the architect of the monument. "I was about 8 years old, I guess," she says. "I remember her helping to plan that monument and planning how to make that square there." Along with the monument and the derelict remains of his eponymous park, the doctor's spirit lives on in other corners of the city. "Dr. Allen was instrumental in establishing Tracy Aviary," Tim Brown, the organization's CEO tells City Weekly via email. "In addition to providing financial support and guidance, Dr. Allen also allowed his good name to be associated with the organization and helped strengthen the Aviary's connection among influential Salt Lake community members." Beginning in the late 1930s, the character of Allen Park began to change. Dr. Allen started to collect old houses that had been built elsewhere and had outlived their usefulness. He had them trucked across town and installed on new foundations on the property east of the main house. One of the first was a log house built in the 1850s by pioneer Thomas Boam in what is now Holladay. During the 1940s, he acquired a number of old employee houses that had been built by a Kennecott Copper predecessor company in a town on the west side of Salt Lake Valley. "I think the house mover was a patient of father's who couldn't pay his bills," Mary Rose said. "So he moved these little houses in here, in exchange ... Gee, as a kid I'd wake up and see another house coming down the driveway on a truck." Those little houses were cobbled together in pairs to create duplexes. Some fit together seamlessly; others made very odd couples. Dr. Allen named four of the buildings after his children. There was the Mary Rose, the Roberta (Amy's middle name), the George Albert and the Sally Ann. A fifth building, that began life as a gas station, he named the Ethylene. Mary Rose recalled that one regular visitor to Allen Park was George Albert Smith, the president of The Church of Jesus Christ of Latter-day Saints from 1945 to 1951. "He would have his driver bring him out here in, mostly, early evening," she said. "He liked to chat with father. I guess he was history-minded. And father certainly was ... And George Albert Smith was a lovely old gentleman." In his later years, Dr. Allen shared his passion for poetry with his visitors and renters, creating decorated concrete monuments inset with quotations. "Down in our basement he had a grinding machine," Mary Rose said. "And mother would go down to the tile store and, in the dump behind the tile store, was the stuff—the leftovers ... Father would go down in the basement and grind them off and make all his letters and so forth. And he would mix the cement by himself." Today, you can find these monuments scattered around Allen Park. When Dr. Allen died in 1961, his wife, Ruth, took over the management of the property. By 1970, when college student Larry Warren moved into 1389 E. Allen Park Drive, Dr. Allen's birds were gone, the "Visitors Welcome" sign had come down and the place was already showing signs of neglect. "I'd tell friends, 'Drive [south] down 13th and you see Westminster on the right. Look left and see the grown-over bird cages and turn in there where it says No Trespassing,'" Larry says. "They kind of thought they were entering a horror-movie set," he says. Everything was so overgrown and abandoned ... It just gave off a creepy vibe from the street. And then, once you got inside, you went, 'Wow, this whole thing is overgrown, and cool, and funky old log homes. Who'd have thought this would be in the middle of a city?'" At that time, Allen Park was known not for its hobbits but for its hippies. "I know my neighbor was a big pothead," he says. "There was always a plume of pot smoke in my neighborhood." He remembers Ruth cruising the property in her big green station wagon. "But she wouldn't drive out on the street, so her whole driving world was inside Allen Park," Larry says. "Even with that limited amount of space, every once in a while she would run low on gas. And then she would give me some money and I would run it down to the Conoco a block away and fill it up. Then she was good for another few weeks." He recalls rent was about $80 or $90 a month, which included heating. Like other units in the park, Larry's place was heated with a small natural gas furnace mounted in the crawl space. The heat came up through a metal grate in the floor. "I remember, the first time I turned the heat on and got up in the middle of the night, I stepped full weight on the heating grate and the bottom of my foot looked like a grilled steak," he says. Lesson learned, during the winter months, he would climb out over the end of the bed to avoid any further flesh-grilling incidents. Larry moved out in 1972 and went on to a career in broadcast and print journalism that allowed him to hang his hat in several homes. "I do remember, of all the places I lived, it was by far the funkiest, most unique, one-of-a kind property," he says. Dr. Allen's wife, Ruth, was a gifted artist who grew up in Chicago and was a fashion illustrator for some of that city's best known department stores. Later in life she became known as an outstanding wildlife artist, contributing illustrations to a family-owned publication devoted to exotic birds. Ruth died in 1985. A year later in Utah Holiday magazine, Ken Kraus wrote an insightful piece on Allen Park noting that Dr. Allen's heirs were struggling to resolve the future of the property. He speculated that the end could be near. "Now believed to be worth about a million and a half dollars, this oasis, this safe harbor from the city, this eight-acre parcel of prime real estate, could be leveled," he wrote. Along with the remaining eight human tenants, four winged ones—the last vestiges of Dr. Allen’s amatuer ornithologist past—will be forced out of Allen Park on Jan. 14. By 1992, Allen Park had caught the eye of David Stanley, then a professor of American literature at Westminster College. Stanley also taught classes in American folklore, and saw the weird little community across the street as an ideal subject for his students. "It's what folklorists call an idiosyncratic environment," he told me recently. "There was kind of a Bohemian side to Utah back then [when Allen Park was built] and Dr. Allen was part of that." That spring, some of his students toured Allen Park with Amy Allen Price. A videotape of that tour is now in the Westminster archives. Some of Amy's comments on that tape appear in this story. Stanley said he heard talk then about Westminster possibly buying the property from the Allen family. In April 2007, I was driving Pierre, my daughter's red Mazda Miata convertible, down 1300 East when I spotted an "Apartment for Rent" sign on one of Allen Park's brick pillars. I did a quick U-turn and rolled up to the log house. Standing in front of the house, surrounded by chickens, was Ruth Price, Amy's daughter and Ruth Allen's granddaughter. She looked at Pierre, looked at me and asked, "Are you a real-estate agent?" By that time, Price had become convinced that outsiders were conspiring to take over Allen Park. That belief might have begun when she heard, a few years earlier, about a suggestion in a 1992 Salt Lake City open-space master plan that a public-access trail could be built through the property. "Ruth Price ... says she only recently found out about the city's open-space plans put into law in 1992," Scott Lewis reported in City Weekly in January 2001. "With the discovery, she began organizing local landowners and residents who fear Big Brother is threatening their security, property rights and perhaps even their livelihoods." The city did nothing to allay her suspicions when, in 2008, it passed an ordinance adopting a riparian corridor overlay (RCO) district restricting new construction along above-ground stream corridors including Emigration Creek. It clearly affected the resale value of Allen Park. By then, I had convinced Ruth that I was not a secret agent for Coldwell Banker and was ensconced in the Roberta, a charming two-bedroom cabin north of the creek. I was enchanted by the place. It felt as if I were living in the woods. In summer, the now-mature trees provided a canopy that blocked the heat of the sun and much of the cacophony of the city. In winter, a sunny day after a snowfall would turn Allen Park into a photographer's fantasy. At noon and 5 p.m. each day, the gentle tones of Westminster's carillon would waft over on the wind. I walked around Allen Park with a notebook, writing down all the engraved quotations I could find. Then, with the help of the internet and Bartlett's Familiar Quotations, I tracked down the authors: Alexander Pope, Walt Whitman, Ralph Waldo Emerson, Shakespeare and many others. One of my favorite quotes, near the roost on the south driveway, is from Rabindranath Tagore: "Faith is the bird that feels the light and sings when the dawn is still dark." A few monuments have fallen over in recent years. One, along the north driveway, now lies face down on the pavement. If you could somehow pry it upright, you would find a line from Edward Young: "Too low they build, who build beneath the stars." Like a never-ending scavenger hunt, the more I walked around, the more I found. I also noticed that many of the house numbers were mounted on wooden panels. Accompanying the numbers were whimsical illustrations, some hand-painted with delicate strokes. One shows the silhouette of a cat and four birds perched on a fence, watching each other from a respectful distance. Although Dr. Allen's fancy pheasants were long gone, Amy and Ruth kept a brood of peacocks and less-exotic fowl, including chickens, turkeys and geese. As time went on, I began feeding the birds, sharing the duties with Glen and another renter. I met a cast of colorful characters in Allen Park. There was Randall, who claimed he had been fine until a bite from a brown recluse spider sent him off the deep end. We nicknamed him Rando after he started patrolling the place at night, dressed in black leathers, an assault rifle slung over his shoulder. There was Daniel, who lived for a while in the Roost, the old barn near the front entrance, and was assigned to keep the gatecrashers out. His weapon of choice was the machete, though I don't think he ever used it on anybody. Then there was Ruth. Oh, Ruth. You were a force. You could charm me one day and berate me the next. But I took it all in stride. I soon discovered that maintenance in Allen Park could be a little sporadic. In 2010, I noticed a crack in the fiberglass tub in my bathroom and notified Ruth and Amy. Three years later, the crack had become a chasm and water was pouring out, causing the floor to buckle. Glen removed the tub and the toilet. Ruth gave me a key to the vacant apartment next door so I didn't have to pee in the bushes. Thus began my 11 months without a shower. At least not in my own home. I waited. I waited some more. Finally, after about five months, I had a toilet. But it took another six months to finish the tile work and hook up the new tub. In the meantime, my girlfriend Lynne, bless her heart, let me use her shower. During my years in Allen Park I have seen many people throw up their hands and move out. But a few of us persisted, convinced that the magic of our Sugar House sanctuary far outweighed the headaches. "As Amy advanced in years, I helped her on occasion with errands and bookkeeping," she wrote. "I got to know her as a tough pioneer woman—with the dust of the trail still clinging to her skirts—and as a former socialite. I learned she was once a fashion designer and model in San Francisco. She always took a keen interest in what I was wearing. She often mused on joyful childhood memories, spending time alongside her father as he created Allen Park. She had her own pet turkey, which she rode as if it were a pony. "Her home was a cabin of curiosities, exhibiting layers of history: her father's exotic bird and other animal taxidermy, commingling with white doves cooing in the background; a bear-skin rug casually draped over the balcony banister; and life-size portraits of Amy's parents, Dr. and Mrs. Allen, flanking either side of the double staircase, along with a glamorous portrait of Amy. "The house I live in has been here since the '30s, and since then, generations of students, artists, hippies, college professors, party animals, recluses, misfits, survivalists and other interesting characters have occupied the same cabin ... On a regular basis, many of these former residents drive by to visit the cabin they so fondly recall. With few exceptions, they express surprise at how little some things have changed over the years." About three years ago, Amy suffered a stroke, moved into an assisted-living facility, and died not long afterward. Then, last summer, Ruth also died, leaving Glen to run the place by himself. "You will please take notice that as of the 31st day of December 2018, the end of your current rental period, your right to occupy the premises ... will be terminated and you are hereby required to vacate said premises ..." This was followed by some aggressive legal language threatening me with treble damages if I failed to comply. In response to my angry reaction, and those of other residents, Four Winds gave us a couple more weeks, moving our deadline to Jan. 14. That means that, when this story appears in print, we will be bracing for our reentry into the real world. It turns out that the ownership of Allen Park and several other family properties is being settled in probate court. Mary Rose, the last survivor among George Allen's four children, still owns a piece of the pie. So do other members of the Allen clan. The court has appointed a private company, Stagg Fiduciary Services, to serve as the personal representative for Amy's estate. According to utcourts.gov, the responsibilities of a personal representative include contacting heirs and creditors, taking inventory of the estate, paying taxes, selling property to pay taxes or debts, and distributing the remaining proceeds to the heirs. Stagg, in turn, hired Four Winds Realty to take over the management of Allen Park. It looks as if the scenario anticipated more than 30 years ago by Ken Kraus is finally coming to pass. I wanted to know what might happen to the property, when the case might be settled and why it was necessary to boot out the tenants before its future had been decided. So I called up the person who, as I understood it, was calling the shots: Becky Allred, partner and manager at Stagg Fiduciary. It was a short conversation. She told me that probate is a private matter and, besides that, Stagg was too new to the case to answer any questions about it. "We're moving as fast as we possibly can. That's about all I can tell you," she said. Among those concerned about the future of Allen Park is Kirk Huffaker, executive director of Preservation Utah (formerly the Utah Heritage Foundation). Huffaker says that, over the years, he'd had two conversations with Amy and Ruth to discuss options for the stewardship and preservation of the community. "Obviously, those things didn't happen," he says. "But I feel like the place has the potential to continue to be a unique residential community that preserves that rustic and authentic quality of many of the original buildings and I think, with the right development approach, could balance preservation with some additional improvements." Huffaker says that approach might include new buildings of a relatively small scale. "You'd have to do some things, probably, to enhance the property economically. But I think, really, what I'd like to see is a balance there." Both state and federal governments offer preservation tax credits, he says. "The ideal developer of this property is someone who is in it with a long view," he says. "This is not something to buy, hold onto for two or three years, and turn over to some other big conglomerate." Joel Paterson, Salt Lake City zoning administrator, says that putting a public trail through Allen Park, as suggested by the city's 1992 open-space plan, would require the cooperation of the property owners. "So, yeah, it would be fantastic to have a trail along that section along the creek, but there's nothing in the works at the moment, certainly, to try to push that through," Paterson says. When I asked him for an example of that approach, he pointed to the Federal Heights subdivision in the foothills near the University's block U. "As that subdivision was being developed, the city worked with the developer to provide an easement and helped develop the trail that goes through that subdivision," he says. "It's part of the Bonneville Shoreline Trail connection." Paterson notes that the 2008 riparian corridor overlay district would limit new construction in Allen Park, specifically within 50 feet of the high-water mark of Emigration Creek. However, he says that the district makes allowances for "lawfully established structures" built before 2008. 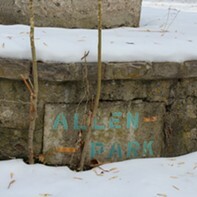 "So, certainly, the structures that are existing in Allen Park would be able to be renovated, repaired and maintained."